The old “hachiroku” Toyota Corolla AE86 is one of the most beloved cars in the automotive world. Simple, light, rear-wheel drive and not much else. But these 1980s heroes are getting old and frail, except for one in Japan. 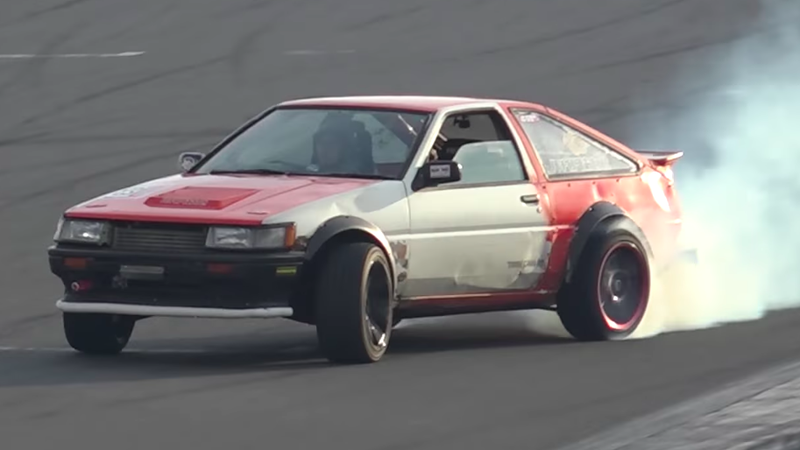 This car popped onto my radar on NoriYaro’s newest video, going to an 86-only day at Tsukuba circuit in Japan, pretty much heaven for anyone who dreams about owning one of these live-rear-axle Toyotas. They have a gigantic cult following, these last rear-drive Corollas, which were for so many years common and cheap to the point of being disposable. The part you want to watch starts at about eight minutes in. He makes his own collectible Corolla trading cards. It’s all part of the car’s drift setup, to make it good to drive. But how it handles doesn’t interest me as much as how it’s built. Up front is not some five-valve-per-cylinder Toyota engine, or anything else quite as old, but rather a newer and more common Nissan SR20. With the SR20, it’s easier to make power than with something smaller and more high-strung than what AE86s usually use. Thumbs down from the Corolla faithful. Inside the car is stripped, but it has some extra metal bars behind the front seats. An interior tire rack! It makes the car easier to take out to a track day. “That’s a waste,” his buddy says. “My head is clever, but hairless,” Perotan jokes. Also inside is an extra oil reservoir for the differential, one taken out of a full-size Toyota Crown. It’s a 7.5-inch diff; for a Corolla that weighs about as much as a large tricycle, it will never, ever fail. Another odd little mod is that Perotan hooked up a water-sprayer in front of the rear tires. These aren’t for easier burnouts, but rather for cooling down the tire after a drift session. It greatly increases the life of the tire, something that other drivers manage by driving through little cool-down puddles after a lot of driving, or hosing down their car in the pits. Perotan’s system is smaller and neater, looking like it was taken off of a headlight washer system or something. In all, the car looks hideous to AE86 faithful and it pisses off everyone around him, but it drives great and it’ll never break. It’s a totally different attitude towards building a car, particularly an old, thin, little Corolla. I adore it. I Drove One Of These As A Rally Car. I Need One.